Coal Creek gold dredge, Yukon-Charley Rivers National Preserve. NPS photo. The Spring 2019 Newsletter of the Alaska Anthropological Association is now available! Best wishes for a great season! The Alaska Anthropological Association Public Education Group (PEG), in partnership with other organizations, has received the 2018 Society for American Archaeology’s award for Best Archaeology Month Poster. 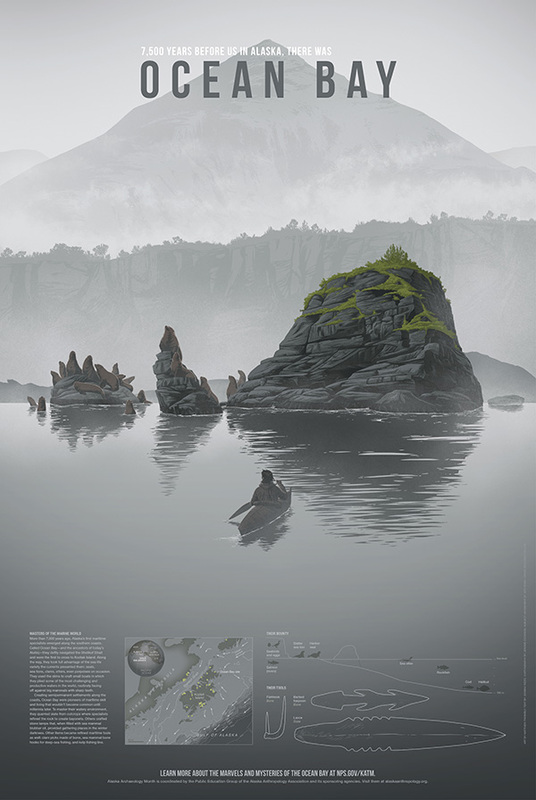 The 2018 award winning poster features the 7,500 year old maritime history and culture of Ocean Bay, the ancestral homeland of today’s Alutiiq communities. This is the fifth consecutive year that Alaska has won the prestigious award. Congratulations! 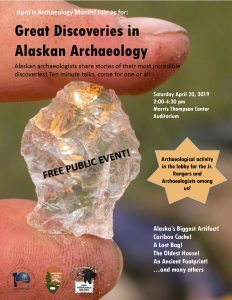 Join us Saturday, April 20 at the Morris Thompson Center for 10 minute talks by Alaskan archaeologists about some of the amazing finds they have made around the state. Free public lecture in the Auditorium and free kids craft in the lobby. 2-4:40 pm. 1) The Professional Achievement Award presented by the Alaska Anthropological Association in 2014 is hereby revoked. 2) Membership in the Alaska Anthropological Association is prohibited. 3) Participation in the Annual Meeting of the Alaska Anthropological Association and/or any events or activities sponsored or hosted by the Alaska Anthropological Association is prohibited. We are looking for contributions to the Recent Research Notes column in the Alaska Journal of Anthropology. These would be brief (1-3 paragraphs maximum) reports on upcoming, ongoing, or recently completed projects, new C-14 dates, or laboratory findings that might be of interest to the Arctic/subarctic research community. Authors can submit multiple notes if they have different subjects. Items already covered in the newsletter are appropriate, as AJA has a broader circulation, and exists in permanent hard copy in libraries. Entries can be submitted at any time (while a project is fresh in your mind) and will be placed in the next column to be published after their submission. We do not need precise site locations, client’s names, or any other data that can be considered protected or proprietary. It is understood that in some cases project sponsors need to review reports and give permission for such notes to be published. We understand that this may take some time, and will interpret “recent” liberally to accommodate such cases. Submissions can be made to Anne Jensen (amjuics@gmail.com) who edits the column. Electronic submissions (in AJA style) are strongly preferred. The AJA Style Guide can be found here. Please take note of the formatting of tables with C14 dates, as well as the preferred date formats. Best practices suggest including information on the probability distribution for calibrated dates. The Alaska Anthropology Association seeks a newsletter editor! The main responsibilities of the association’s newsletter editor are to solicit materials from members and researchers, edit, prepare, produce, and send out a quarterly newsletter to the association’s members. Interested parties should be aware that time preparing a single newsletter varies, but on average takes at least 8 hours to prepare. Additionally, it is advised that the interested party have access to Adobe InDesign and Acrobat. This is a fun and exciting way to be involved with the association! If you have additional questions or are interested please send an email of interest to Sam (sccoffman@alaska.edu) by April 26, 2019. Historical Research Associates, Inc. (HRA) and Northern Land Use Research Alaska, LLC (NLURA) are seeking applicants to develop a qualified applicant pool of Archaeological Technicians for work in 2019 for our Portland, Eugene, Seattle, Spokane, and Missoula offices along with NLURA’s office located in Anchorage. Individuals interested in working for HRA/NLURA in 2019 will be selected only from this pool. The Archaeological Technician – Seasonal performs archaeological field work, lab work, or related office work under the direction and supervision of a HRA/NLURA staff Archaeologist. Applicants approved for the pool must have (at minimum) a Bachelor’s degree in Archaeology or Anthropology. Preferred applicants will have experience working in the field, conducting analysis of research data, and contributing to research reports. Required skills include the ability to effectively conduct research activities, conduct appropriate aspects of fieldwork using appropriate field techniques, develop and maintain positive relationships, the ability to balance work schedules and demands, provide and receive feedback, seek to resolve conflict through communication and collaboration, and use effective verbal and written communication to listen and communicate effectively. Applicants must be proficient in the use of computer programs and database systems and have familiarity with the operations and use of cameras, GPS, and GIS equipment and software. Candidates should assume that most of their working hours will be spent in the field. Position will be open until close of business Tuesday. April 30. Positions are seasonal, and work is on-call, as needed. Acceptance into the qualified applicant pool is not a guarantee of a job offer or a guarantee of hours in 2019. Please submit a letter of interest and resume/CV to Human Resources at hr[at]hrassoc.com. Center for Environmental Management Military Land (CEMML) staff combine mission experience and technical skill to deliver results and meet demanding challenges. Our contributions not only serve project-specific needs but benefit surrounding communities and the nation. Click the link CEMML’s Careers page. In the frames of the International Year of Indigenous Languages declared by the United Nations The Institute for Humanities Research and Indigenous Studies of the North, Russian Academy of Sciences, International Arctic Social Sciences Association (IASSA) and the Association of Indigenous Peoples of the North of Sakha Republic with the support of the International Organization of the Northern Regions “Northern Forum” will hold an International Scientific-Practical Conference “The Indigenous Languages as a Factor in the Sustainable Development of the Arctic” June 27-29, 2019 in Yakutsk, Russia.